The Cate Shirt Dress by Nancy Dee. If Fashion Revolution has you thinking about fast fashion, and the connection between you and your clothes, then maybe you're starting to think about making a change. Maybe you're considering a shift away from Primark, Mango and the rest, and towards something with a little more proven sustainability. Good for you! The big question is, where do you start? It's a tricky area to navigate. Some companies make big claims for ethical behaviour that simply don't stand up under scrutiny. But do you have the time and the energy to do the research? After all, you just need to pick up a new shirt for work, and something for that do next week. How do you make it through the moral maze? Fortunately, you're not alone. Your first stop should be style is... Set up by fashion writer Ceri Heathcote, the prime focus of the site is to make it easy to find alternatives to fast fashion. It features a search engine that links to thousands of ethical choices. But it gets easier, as they've just compiled a top 50 (well, 51) chart of the names that will really get you started on the road to sustainable fashion. There are some high street names on there, like Timberland. There are cult names, like TOMS and Howies. The big hitters in the ethical fashion game like People Tree and Patagonia are there. And there are plenty of names that you should get to know better, like the brilliant Nancy Dee (co-founded by an ex-workmate of yr. humble author, hi Tamsin! ), Choolips and Antiform. The list is a one-stop primer for all the names you need in UK sustainable fashion. A firm and hearty handshake to Clare and style is... for doing all the legwork, so you can just get on and do your shopping. Read the style is... 51 Alternatives To High Street Fashion here. EDIT: earlier versions of this post incorrectly credited Arthur & Henry founder Clare Lissaman as the writer behind style is... We apologise to both Clare and Ceri Heathcote for the confusion. The big problem with fashion, and in particular fast fashion, is that we've lost any sense of connectivity with the people who make the clothes. Fast fashion garments are production line items, put together from elements that may have been created thousands of miles from the factory where they are assembled. Even the farmers who produce the fabric from which these clothes are made don't know the final destination of their cotton. That's a problem. If we don't care where our clothes are coming from, why should we care about the people who make them? That kind of disconnection can lead to shocking events like April's Rana Plaza collapse. It's easy to abuse the system when no-one cares enough to monitor it. So, what do we do about it? Fashion Revolution have an idea. Put together by key figures in the fashion industry, they want to pose a simple question--who makes your clothes? To that end, they're issuing a challenge. They want people to find a favourite article of clothing, and then ask the manufacturer where it came from via social media, then make a video of themselves wearing that item, explaining why they like it and why they want to know more about it. This is part of the buildup to Fashion Revolution Day next April 24th. This is planned to be a huge day of action involving everyone from consumers to suppliers to stores, opening up the conversation about how modern clothing is made. It's a great idea, and we'll keep you posted on developments here at the Pier as we move towards next April. In the meantime, check out the Fashion Revolution site for more information. 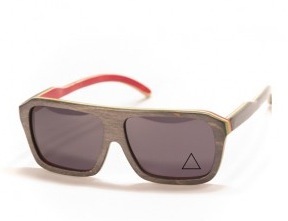 Back in March I wrote about Proof Eyewear, a sustainable brand making waves in the US with their cool retro styling and wooden frames made from, among other things, recycled skateboards. Now, I'm happy to report that Proof has expanded, and there's an all-new UK store to explore. Featuring the full range of frames, made from sustainable materials like bamboo, lacewood and plant resins, Proof are also taking the opportunity to open up their remit to new product lines. The new collection, premiering especially to coincide with the UK launch, includes a wood "wallet" (more of a money clip, really: it's two slabs of wood with a recycled inner-tube rubber band to hold a few cards and some folding cash) that started as a fun side project before demand for it blew up. 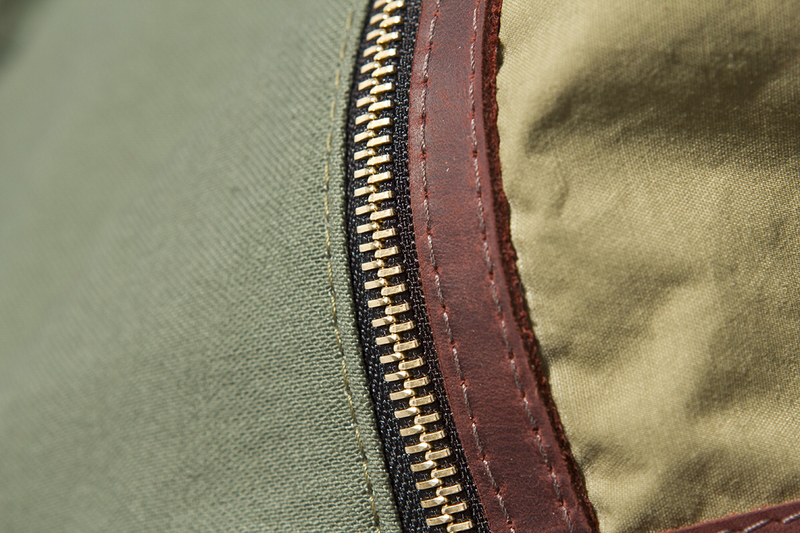 The range will expand further into apparel later in the year, which is sure to feature Proof's commitment to sustainable material, ethical manufacture and relaxed, edgy style. After all, if icons like Beyoncé and Snoop Lion like Proof, they must be doing something right, right? Prices for Proof sunglasses hover around the £100-130 range. Perhaps a little pricy for shades, but bear in mind they're designed so that you can pop in prescription lenses as well, creating a slick, one-of-a-kind look. There's plenty to choose from, and the chunky Aviator-style silhouette is both timeless and, in the bold colours in which Proof specialises, very on-trend. As a writer, I understand the importance of coffee. There are days when it's the fuel that gets me running and gives me the power to write through the day. Yes, I am one of those people that regularly sits with the Mobile Blogging Solution in a good cafe with a mug of something caffeinated, banging out a screenplay, short story or blog post. 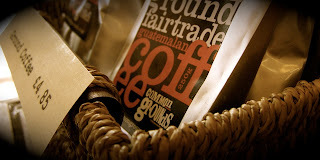 The next time I'm in Belfast, I'll make time to visit Common Grounds. They're a non-profit, that channels all the money they make into support for humanitarian causes in the developing world. To date, they've risen over £55,000 for deserving charities since they opened their doors in September 2004 (including, I'm pleased to note, money to our friends at Habitat For Humanity). Of course, it helps that Common Grounds is a seriously good coffee shop in its own right. It's twice won Belfast Fairtrade Cafe of the Year, and the cinnamon scones are legendary. It's a hub of the vibrant Holylands district in Belfast, a place for people to meet, eat drink and enjoy, knowing that every latte is making a difference somewhere in the world. People moan about the big-brand coffee chains, but often there's little choice but the Barstucks and Costas. It's great to see an independent place like Common Grounds doing so well, without compromising on their ethics or the morals that got them started in the first place. I couldn't be happier that they're a client of Pier32, and I urge you to give them a go if you're in the area. Get the full story at the Common Grounds website. Charities are in a tough place at the moment, and it's not going to get any easier. They are expected to pull up the slack as the public sector has its belt forcibly tightened in a governmental wedgie. They are expected to do this as their funding is cut and as donations drop due to the prevailing economic slump. It amazes me that charities can do their jobs, not just in the current chilly financial climate, but at all. They're subject to one of the most unfair paradoxes around. We expect charities to raise money, but there are screams of horror should they hold any of it back for administration or, god forbid, growth. Duncan Green of Oxfam lays out the problem neatly in a recent article for The Guardian. Charities, he says, are caught between a very big rock and a very hard place. They can't afford to attract the sort of managerial talent that would enable them to make more money for their chosen cause. Any charity that is seen to be "profligate" with their funds are in for an instant PR hosedown with raw sewage. How dare they hold back 3% of their funds to pay for staff and premises? How dare they think about actually growing, or investing in the future? Won't somebody think of the children? This isn't just wrong-headed, it's actively dangerous. One in ten charities recently polled think that they will be drawing down the shutters in the next twelve months. Horrible, but hardly surprising when they're actively discouraged away from modern business practices that might just make the difference between survival of a much needed resource, or yet another cause on the scrapheap. Is it coincidental that the most successful charities (and let's be clear about the definition here; success in raising funds for their cause is what I mean) are the ones that have managed to rise above the snark and cant and run themselves along well-proven business lines. Any charity that's worthy of the name will be doing all they can to minimise costs and maximise their usefulness to their chosen cause. That's straightforward enough. But if there is an opportunity to significantly raise their game, either through the hiring of skilled managers or investment in infrastructure, then surely it's a no-brainer to take a bit now and pay it back with interest later? The small-mindedness with which people view charities boggles my mind, and it's frankly unsustainable nowadays. If you want charities to succeed, if you want them to be part of The Big Society (gone a bit quiet on that front recently, hasn't it?) then you either need to give them appropriate funding, or the freedom to be able to raise it in whatever way they feel fit. It really is about time that we gave charities a break. We need to wise up, and see them as business entities with responsibilities to their stakeholders, who need them to survive and thrive. A healthy Third Sector is a vital part of the UK's social welfare programme. We don't have the luxury of treating it with disdain or patronising neglect any more. To finish, a repost of a TED talk that will always bear repeating, from financier, charity maven and activist Dan Pallotta. The make-do-and-mend model is hugely important when it comes to sustainability in fashion, and it's a real shame that skills seen as vital not that long ago seem to have vanished. What do you do if a beloved jumper sprouts a mothball or two? Do you bin it and try to find something similar... or do you fix it yourself, for a fraction of the financial and environmental cost? It's always tough to try and figure this sort of stuff out for yourself. What if there was a place you could go to meet like-minded people, get help and advice on how to restore your beloved belongings, and have tea and cake while you're at it? That's what Repair Cafés are all about. The Repair Café Foundation, set up in late 2009 by Dutch activist Martine Postma, is dedicated to setting up spaces where people can go to fix their stuff, pick the brains of experts and specialists and just generally hang out in a comfortable environment with good baked goods. Each Repair Café has tools and materials to help you make any repairs you need. You'll also find repair specialists such as electricians, seamstresses, carpenters and bicycle mechanics. In short. it's a one stop shop to fix up your stuff and meet new friends. You're welcome even if you don't have anything to repair, and who knows, you could find your own expertise comes in handy! There are Repair Cafés in 4 UK locations at the moment, and we need to see more. The Repair Café Foundation can help you set one up, but really there's nothing stopping you and a like-minded bunch of friends from going full-on DIY and starting one from scratch. It's a great idea, and one that's starting to spread. Ms. Wandas has a poll up, and are looking at starting up a network of UK-based repair cafes. It's a trend that's going to blow up in the next year or so. Now's the chance to fix yourself up nice. For more check out the Repair Café Foundation website, and take part in Ms Wandas poll, why dontcha? Upcycling is a great way of reusing old materials in a fresh new way, but it has its problems. It's extremely labour-intensive, for one thing. It requires a lot of work to source, break down and retask the materials in question. It's not something that can be easily automated or scaled up to mass production, making upcycling a boutique, small-run solution. "Instead of adapting the waste, it is more about adapting designs and systems to fit the waste materials themselves. By doing this we become able to up-cycle on a larger scale and make a larger environmental impact. “Our trials started by analysing and researching the types and quantities of waste along with key sources they were coming from. Once we found a key area or type of waste that had the largest output, we tried to reshape the systems, collection methods, and sometimes even designs, in order to bring the waste back into production with as little cost and time as possible." The results thus far have been impressive. Each garment in Reet's new collection uses nearly 90% less electricity and 85% less water than traditionally sourced garments. With the trials succussfully completed, Bexcimo are looking to partner with bigger brands that would be interested in putting sustainability at the heart of their business. This is a major step forward. The energy savings inherent in industrial-scale upcycling will make the process an integral part of fashion workflow in the next few years. Reet Aus might have just changed the game for the better. For more, check out the Reet Aus website. These hip wordsmiths in the rather cool Pier32-supplied t-shirts are the six nominees for Spoke, a competition that aims to find a new young poet laureate for London. Jolade, Bridget, Warsan, Momina, Aisling and James are already making names for themselves as poets, mentors, speakers and educators. Spoke intends to help them push their talents to the next level. 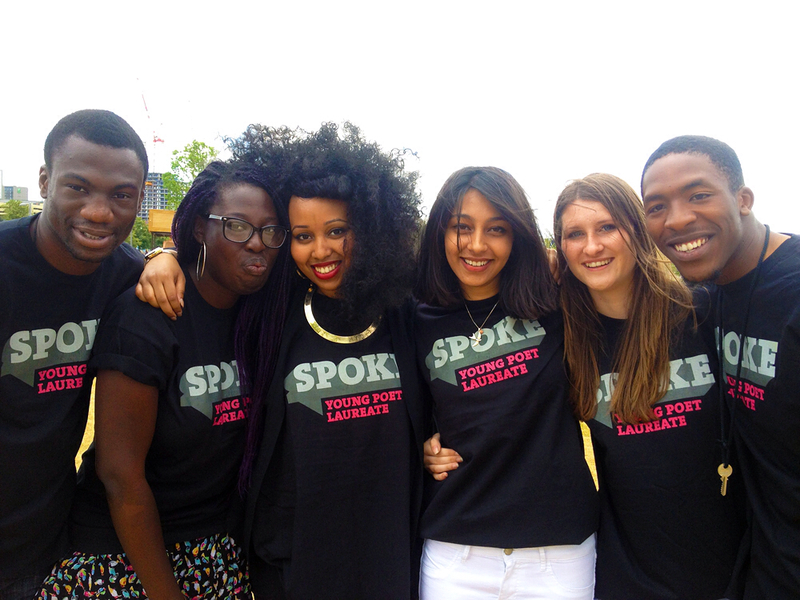 Spoke is a new, visionary poetry and spoken word programme that will offer people in East London an opportunity to watch, perform and develop careers in spoken word. The programme will also allow people to perform poetry in and around the newly evolved Queen Elizabeth Olympic Park, the former site of the Olympic Park. Pier32's involvement in the project is via our friends at A New Direction, tireless campaigners for the value of arts and culture to the lives of all young Londoners. They promote practical ways that schools and other institutions can develop cultural opportunities. We're all for that here at The Pier, and are happy to support Spoke. The new Young Poet Laureate for London will be announced on the 3rd of October. For more on the competition, and to find out more about the nominees, visit the A New Direction website.